This look I shoot in a legendary location – Salford Quays- a home of BBC and media students of Salford University. My outfit is very “street style” today, I layered this bright blue Russian scarf that I got when I traveled back home (more info about how to wear a Russian scarf in my previous post HERE ). What I love about scarfs is that they can brighten up an outfit while adding texture and warmth. And you don’t have to wait for spring to be able to wear colour! I added this very simple black coat by H&M, which I got couple of years back, and my stylish, signature bowling Yasmine bag by one and only Vivienne Westwood . I’m over the moon to finally own it. Although it looks a bit small you can really fit an “elephant” into it . I was so surprised to discover that all my daily essentials including my camera can be easily accommodated inside. The NYFW is in full swing and I’m very excited to see what designers prepared for us for this season, so far I’m in love with oversized jackets and fringe boots by Rebecca Minkoff and colourful 70’s cocktail dresses by Kate Spade. My next week will be filled with lots of press events and of course I will be covering all of them on my blog here. Don’t forget to pop in. See you all very soon . I like your scarf!!! Great outfit!!! 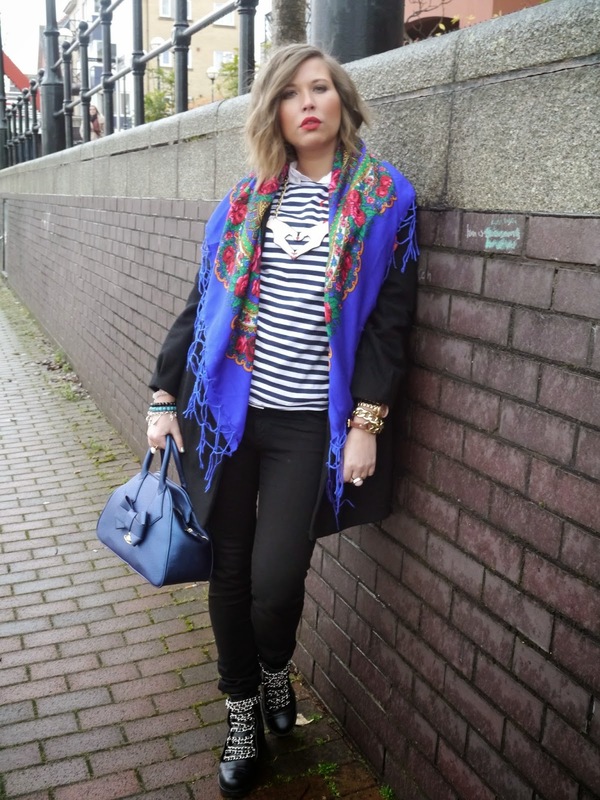 Great accessories & lip stick colour!